I’m back! And I have a list! I saw this meme last night and it got me thinking. Now, I don’t know if Gaiman actually said this, as memes are known to be inaccurately quoted but the message is true. What self-professed bibliophile could come up with a short list of 5 of their most beloved books? I certainly can’t. But the message did get me thinking; could we come up with a short list of 5 books that have had the most influence on our lives? Let’s try. To make this challenge even more meaningful, don’t think too hard about this. Pick the 5 that pop immediately into your head. Those that rise in your thoughts first probably have had the greatest impact. Here are mine. The Nancy Drew series. Now before you call me out as a cheater, hear me out. No one Nancy Drew mystery comes to mind. It is the series and how it influenced my behavior that stands out. The Nancy Drew series was not my introduction into literature (that would be Goldilocks and the Three Bears) but it was the gateway to my reading addiction. Between the ages of 10 and 14 I would rather read a ND then watch TV. To this day, I prefer books to any other hobby or habit. Two of my friends and I decided to become the neighborhood detectives. We combed the streets looking for a good mystery to solve. Many a Saturday afternoon was spent peering into back yards and around the small industrial shops that surround our urban houses. We were the first to figure out that the old MacDonald” sisters” were not sisters at all. Surely no two sisters held hands and kissed as they sat sipping tea in their backyard. Mr. Cinnomini liked to sneak flowers to Miss Clarks porch; he was married she was not. While we never did find a mystery worth solving for money, we did exercise our minds and bodies while we looked for clues. The most important lesson I learned from ND was that even young girls could be independent and smart. Macbeth. I think I have talked about my early introduction to Shakespeare before, so forgive me if I am repeating myself. In my senior year of high school our English instructor took a leave of absence. The school’s only other English teacher was generous enough to take on our class. He was teaching Shakespeare in his class, so it made sense to do the same in ours. This was at a time when I found myself at a cross-road. My peers were pulling me in two directions. I could let the less desirable of my friends influence my behavior or I could spend more time with my studious friends and get serious about college. The damage that Lady Macbeth inflicted on her mind woke me up. Her famous, “Out damn spot” speech hit a nerve. I credit Mr. Foster’s acting while reading the lines for my final decision. To this day, I strive to make damn sure I never do anything that I would regret to the point to permanently stain my mind and soul. Guess which of my peers won. The Divine Comedy. My introduction to the humanities was Dante’s classic work. My humanities professor, Mr. Hobart was obsessed with the poem and spent an entire semester teaching its meaning to us wide-eyed college freshmen. I too learned to love the poem-I have 6 translations- and it influenced my attitude towards classic literature. Even after dropping out of college I felt the pull of Dante and his warning of “you reap what you sow”. It is Dante who turned me once again towards higher education. I wanted to redeem myself and prove that I could be graced with intellect. This is not as snobby as it sounds. I wanted to show myself I was smarter than I gave myself credit. I did not want to abandon the hope that if I worked hard enough, I, like Dante could find my way out of the woods of ignorance and fear. A Flash of Lightning in the Dark of Night. For a while I was lost in a dark wood. Even though I was married and had a wonderful child something was not right. Like a lot of people I turned to eastern philosophy in the hopes of correcting my troubles. The Dali Lama has had a huge impact on my life. So much so that it would take a separate blog post to explain. But it is this book of his that really changed my life. He talks a lot about victimhood in this book and how many of us continue to identify with and hold onto old wrongs. This was me and why I felt so damaged. His message was simple yet powerful. If you cannot forgive those that have hurt you, at least forgive yourself for allowing the hurt to continue. Let it go and move on! The only person who makes you feel victimized is you. Once that sunk in, I felt something I had never felt before, control of my life and attitude. A Brief History of Nearly Everything. Bill Bryson is my hero! Upon returning to college one of my first classes was in natural science. I quickly realized I lacked any scientific knowledge (okay, that’s not true, I was a gardener but had not connected the two until this book). Bryson’s book not only brought me up to speed on science, but allowed me to explore a part of me I didn’t know existed. I learned I love science! After Bryson I read anything and everything from books on quantum mechanics to astrophysics. Had I been younger and not a mother, I would have switched majors and headed to New York to intern at the Natural History museum. As my bio says I have morphed from a spiritual hippie to a science geek. All because of Bill Bryson. Okay, that’s my list. What’s on yours? Only five? Still, an interesting challenge. I wouldn’t know where to begin … even five in say elementary school. I admit there are more than five for me too. 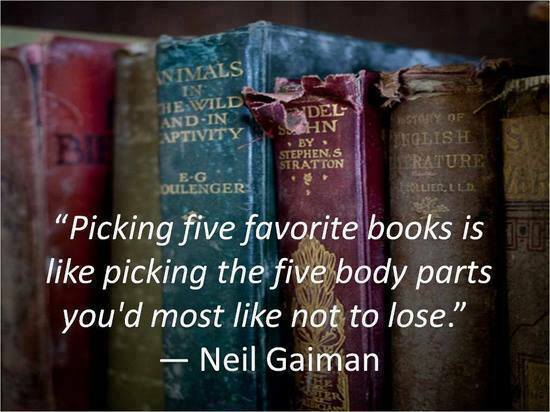 This is why I came up with the idea of writing about the first five that come to mind. I grabbed a pen and started writing titles. The fun come when you start writing about the books. Have fun! Ignore this post. I am testing the feature. I absolutely love The Greatest Show on Earth. I did a blog post about it when it came out. If I had to name my top favorite reads, this would be one of them. Thanks for the list Martin, I really like it. 60s: definitely The Lord of the Rings — I’d read it twice before graduating, but only twice more since then. 70s: The Water-Babies — call me sentimental, but fatherhood does something to you. 80s: The White Goddess by Robert Graves — not because I believed it all (I wasn’t alone in having huge reservations about his conclusions) but because it widened my horizons on mythology, the universality of fairy tales, the uses and abuses of etymology, the poetic impulse and much more. 90s: Borges’ Ficciones — I must have got this some years before, but only really enjoyed this collection of short stories at this time, my first real inkling I suppose of what metafiction is (before I’d encountered tohe word). 00s: Italo Calvino’s Italian Folktales had the same effect on me as The White Goddess in impressing on me the essence of narrative, pure and simple (characterisation of course being pretty much absent in most folk- and fairy-tales). There’s precious little non-fiction here, but I probably read a lot more of that (as opposed to fiction) from the 70s until this decade. As far as non-fiction is concerned I was pretty voracious, reading books on popular science and archaeology, religion and history, art and language, but none have influenced me as much as this selection. And these are only just stand-outs that I can recall just now — tomorrow might throw up a different list! PS I have a lovely image of the Dali Lama dressed in saffron and sporting a huge waxed moustache — I’m not sure that’s who you meant! Previous Previous post: Dante’s Inferno: Fun Facts!